Tespa is the leader in collegiate esports on campus and on the competitive stage. Promoting healthy competition and building connections among student gamers is Tespa’s mission for college esports. With Tespa, you can meet up with other students and schools who embrace the gaming lifestyle. The power to join a community, compete in tournaments, or start your own chapter is only a click away. 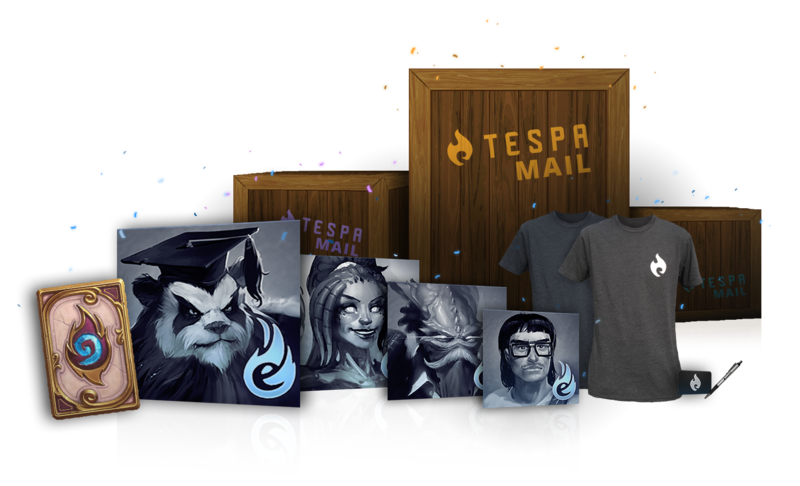 Tespa sends you epic loot— from t-shirts and gaming hardware to promotional gear and digital goodies. Connect with other gamers and represent esports on your campus! Better together: Tespa connects gamers across the country to each other and to the world of collegiate esports. A Tespa chapter at your school puts the nation's top collegiate esports organization in your corner, bringing you event support, experience you can trust, and a nonstop supply of gaming loot. Whether your goal is to start a chapter on your campus, or join an established gaming community, Tespa's support will level up your gaming experience. Welcome back to class with Tespa! Tespa announces new Fall programs for students, competitors, and chapter leaders.